There is always a small bag of raw pumpkin seeds in my freezer. Sometimes I use them to make granola. Other times I sprinkle a handful on top of my quick breads and muffins. But I especially like to use them in this Pumpkin Seed Brittle. 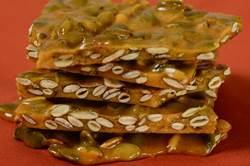 This brittle is a delicious confection made of toasted pumpkin seeds encased in a cooked sugar syrup. It's hard and it's brittle, yet crunchy and sweet. It can be eaten alone or ground and sprinkled over a bowl of ice cream, as a garnish for frosted cakes or it makes a nice topping for a pumpkin pie. All brittles use the most basic of ingredients (sugar, corn syrup, and nuts/seeds). The formula for brittles is about equal volumes of sugar and nuts/seeds, with the volume of corn syrup about half that of the granulated white sugar. What's important to know is that the corn syrup controls the grain of the brittle so adding too little and you have a grainy textured brittle, while adding too much will result in a stringy and sticky brittle. Pumpkin Seed Brittle: Butter a large baking sheet. Place the raw and shelled pumpkin seeds on a baking sheet and bake in a 350 degrees F (180 degrees C) oven for about 4-5 minutes or until lightly brown. Remove from oven and set aside. Have ready the baking soda, vanilla extract, and butter. In a medium sized saucepan over medium high heat, bring the water, corn syrup, sugar, and salt to a boil, stirring constantly with a wooden spoon or heatproof spatula. Cover the saucepan with a lid for about one minute to allow the sides of the pan to wash themselves down and dissolve any sugar crystals. Then remove lid and clamp a candy thermometer to the side of the pan, making sure it does not touch the bottom of the pan. Cook until the syrup reaches soft crack stage (280-285 degrees F) (140 degrees C). Stir in the toasted pumpkin seeds and continue cooking the sugar syrup, stirring often to prevent the pumpkin seeds from sticking to the bottom of the saucepan, until the the candy thermometer reaches hard crack stage (300 degrees F) (149 degrees C). Remove from heat and immediately, and carefully, stir in the baking soda, vanilla extract, and butter (the brittle will puff up) stirring until the foaming almost stops. Immediately pour the brittle, as thinly as possible (but do not spread), onto the buttered baking sheet. If you want a thin brittle, then while the brittle is still very hot, use two forks to stretch the brittle until you get the brittle to how thin you want it. Do this by gently pulling the edges of the brittle, working your way around the entire mass. Let the brittle completely cool and then break into pieces. Store in an airtight container or a plastic freezer bag as this will prevent the brittle from becoming sticky and breaking down. Store at room temperature or in the refrigerator for up to two weeks. Makes about 1 1/2 pounds. Preparation time 1 hour.